Making and breaking encryption is one of the main roles of a signals intelligence agency. That the National Security Agency (NSA) engages in such activities is not surprising. Aspects of this work aren't even secret: NSA involvement in the development of some cryptographic standards was legally mandated and openly acknowledged. A vulnerability mostly affecting older versions of Google's Android operating system may make it possible for attackers to execute malicious code on end-user smartphones that use a wide variety of apps, researchers said. Jan "Starbug" Krissler, the Chaos Computer Club researcher who broke the fingerprint reader security on the new Iphone, had given a long interview to Zeit Online explaining his process and his thoughts on biometrics in general. The CCC's Alex Antener was good enough to translate the interview for us; I've included some of the most interesting bits after the jump. Chaos Computer Club have given Apple one in the eye by undermining their fingerprint biometric security feature within 48 hours of the handset being in the publics hands. This makes the NYPD pavement pounding exhortations of the merits of the 5S security ring a little more hollow. Rest assured that Apple including such a feature is probably the thin wedge of biometrics featuring more in consumer devices. For one Valve, the online gaming colossus, have plans to include biometrics in their forthcoming console Steambox. That's a concerning trend, given the amount of countries already deploying the technology within organs of the state. So what else other biometrics can we expect to see in the gadgets of the near future? Gamasutra: Simon Lachance's Blog - Best coding advice I got in 10 years. Let's talk about clean code! If you are not a coder, please watch anyway, I need you out in the video. I give you the best advice I ever got, and why it is the best advice ever for coder. Enjoy! People often mourn the disappearance of their “local shops.” I’m sure it is the same in many parts of the world. Large chains move in, and the small local businesses, unable to compete on price, close. As the local shops disappear, customers win on price, but they are losing on personal service. At local shops, they know their customers by name, remember the usual order of a familiar face, are happy to go the extra mile for a customer who will come through the door every week. It’s most often the business owner who is behind the counter filling bags and taking money. This direct and personal relationship with the people that their business serves quite naturally provides the local shop with information to meet the needs of their customers. Customers come in and ask if they stock a certain product, one that they have seen advertised on TV; or that is required for a recipe on a recent episode of a cooking show. The local shop owner remembers that three people asked for that same thing this week, and adds it to their order. We’re not dealing with the careful analysis of data collected from thousands of customers here. The shop owner could name the customers that asked for that item — she will point out the new stock to them next time they come in. 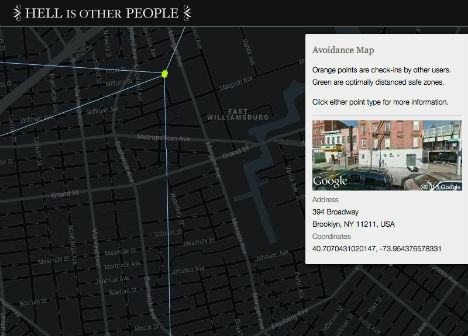 As the co-owner of a bootstrapped digital product, I often feel like we are that local shop on the web. I know many of our customers by name, I know the sort of projects they use our software for. I follow many of them from my personal account on Twitter. I love the fact that they come to speak to me at conferences; that they feel they know us, Drew and Rachel from Perch. This familiarity means they tell us their ideas for the product, and share with us their frustrations in their work. We love being able to tell someone we’ve implemented their suggestions. We’re also part of this ecosystem of small products. Unlike the village shops we are not bound together by location, but I think we are bound together by ethos. When selecting a tool or product to use in our business, I always prefer those by similar small businesses. I feel I can trust that the founders will know us by name, will care about our individual experience with their product. When I get in touch with a query I want to feel as if my issue is truly important to them, perhaps get a personal response from the founder rather than a cheery support representative quoting from a script. This is business. We make a thing, and we sell it at a profit. The money we make enables us to continue to create something that people want, and to support our customers as they use our product. It also enables us to support other people who are running businesses in this digital high street we are part of, from the companies who provide the software we use for our help desk and our bug tracking system, right through to the freelancers who design for us. I am happy with my small shopkeeper status. I talk and write about bootstrapping because I want to show other developers that there is a sane and achievable route to launching a product, a route that doesn’t involve chasing funding rounds or becoming beholden to a board of investors. I love the fact that decisions for my product can be made by the two of us, based on the discussions we have with our customers. If we had investors hoping for a return on their investment, it would be a very different product by now, and I don’t think a better one. I think it is important for those of us succeeding at this to talk about it. As an industry we make a lot of noise about the startup that has just landed a huge funding round. We then bemoan the disappearance of products that we use and love, when the founder sells out to a Yahoo!, Twitter, or Google. Yet we don’t always make the connection between the two. Small sustainable businesses rarely make headlines. So we, the local shopkeepers and tradespeople of the web, need to celebrate our own successes, build each other up, and support each other. I’d love there to be more ways to highlight the amazing products and services out there that are developed by individuals and tiny teams, to celebrate the local shops of the web. Let’s support those people who are crafting small, sustainable businesses—the people who know their customers and are not interested in chasing a lottery-winning dream of acquisition, but instead are happy to make a living making a good thing that other people love. Social media was invented to bring people closer, but the more antisocial among us can use it in a different way: to avoid the people we know. 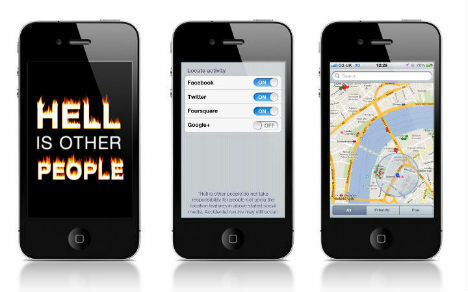 ‘Hell is Other People‘ is an interactive smartphone app that will show you exactly where your friends are based on Foursquare check-ins, and provide ‘safe zones’ where you can hang out without fear of being recognized.